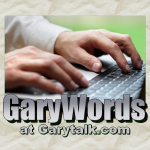 GABBYGARY, the name you see on the original content published on this website, is writer-editor Gary W. Morgan, a semi-retired journalist, radio news anchor, air personality/deejay, music director, commercial specialist, and newspaper editor, reporter, photographer, ad layout and design person. He was even a broadcast radio station manager for awhile, and took a detour that found him managing a retail consumer electronics store for five years before returning to radio broadcasting. Gary’s radio and newspaper career took place from the mid-1960s through the end of the 20th Century. He began the Internet part of his career in 2001 after running for a seat in the Wisconsin State Assembly. He lost the primary and his journey into the world of The Internet began with gusto. These days, Gary writes news and information content for several websites, creates graphic images seen on websites, designs and builds websites, and, programs and presents music on an internet radio station called GreatGold.fm (which can be accessed online at http://GreatGold.fm). 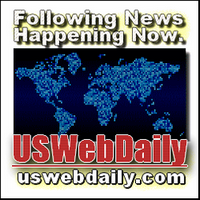 Some of the other websites that keep semi-retired Gary busy editing, writing and maintaining, include Clik2Go.com, McStreamy.com, WisconsinReport.com, and USWebDaily.com. The use of GabbyGary came about, mainly because of a couple of reasons. When he was a youth, his mother said he had “the gift of gab”. That pronouncement was further reinforced during Gary’s adult years when a radio station manager told a program director that Gary was “too gabby” on the air. That was back when that particular station had a largely more music and less talk format. 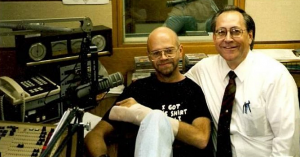 1990s M&M Radio Show team, J.D. Michaels (l) and Gary W. Morgan (r). The manager went so far as to sit in his office and put a stopwatch to the length of time afternoon news anchor Gary Morgan and his on-air buddy, J.D. Michaels, talked together during after-news “happy talk”. The program director had a conversation with Gary and his on-air buddy, cautioning them about talking past 90 seconds before going to music. That encouraged the pair to be even more entertaining and informative for lengthier periods after news reports, especially since Gary received many compliments on the street about he and his on-air buddy being enjoyable to listen to. Each hour of the Morgan and Michaels Radio Show (J.D. Michaels insisted it was the Michaels and Morgan Show) developed into very few song selections, if any, being played on the air. It soon became apparent the audience loved the banter back and forth, plus the conversations with news makers, politicians and other guests, in between. The station, mysteriously, officially changed to a mostly talk format all day. So, that’s the story of the GabbyGary moniker. GabbyGary.COM, GabbyGary.NET, GabbyGary.ORG, and GabbyGary.ROCKS, which all take you to Garytalk.com. BY THE WAY: Twitter.com/gabbygary was Gary W. Morgan’s first attempt at setting up the original GabbyGary Twitter account, but, he couldn’t remember the password to get back in after he logged out the first time. That’s when he resorted to setting up the Gabby_Gary Twitter account. Since that unfortunate development, he has written down user names and corresponding passwords, and, keeps them in a safe place. OTHER EMPLOYMENT and Occupations: During his teen and early adult years, Gary was a cook, waiter, warehouse, construction, factory worker and magazine distribution agency employee. He also was a telemarketer in between jobs in his chosen adult career fields. He also tried to represent a Wisconsin Assembly District in the Year 2000 election, however, he lost the Primary to his opponent (But, that’s Another Story).